It’s amazing to think of the changes and progression our world has seen since 1984! We put together some information on some of the changes we as an organization have seen and some changes we’ve seen as a country. Check it out! The Food Drive Is Going Full Strength! Our branches are hosting a friendly competition to benefit the local food banks in over 80 communities across the nation! Our hope is to give a little something back to the communities who have welcomed and supported us in the past 30 years! Want to help your local branch in the competition? Simply drop off any non-perishable food items through next Monday, the winning branch will be announced next week! Appreciate Your Staff- We Do! 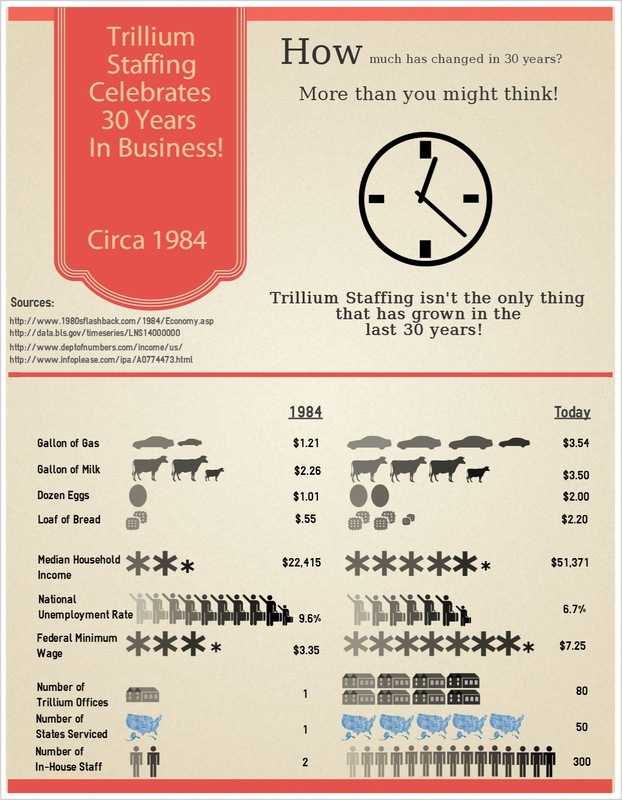 It’s because of each of our valued clients, candidates, employees, and communities that Trillium celebrates our 30th business anniversary this month! We are excited to recognize our great team of employees nationwide for their contributions to us and their communities. Each week this month we will be randomly selecting several Trillium employees and thanking them for contributions as well as sending them a $50 VISA gift card. We truly appreciate each and every individual who selects us to represent them in their career search! Was the last time you heard the phrase “Professional Development Day” in relation to teachers training while students had the day off? Shouldn’t we all take a day away from our primary responsibilities to refresh our skills and cross train with our peers? Absolutely! While it may seem nearly impossible to pull your staff away from their day to day duties, the growth and development could be priceless for your organization. Partnering seasoned staff members with those who are new to the organization or even from different departments, can be great way to gain new insights, ideas, and processes. Training and employee development can be performed as formally or informally as you see fit and can be achieved with very little financial investment. The key components to hosting a successful staff development day are having a well planned and organized agenda outlining what areas you hope to cover and what objectives you have to accomplish. Be sure to consider your audience and set clear expectations for everyone who will be joining on what they should bring, what they should prepare for, and any topics that they should be prepared to speak on. Whether you are experienced in the staffing industry or have previous recruiting or HR experience in another industry; if you are seeking a career change a Recruiter position with Trillium Staffing Solutions may be the right fit for you! Our Recruiters work closely with clients to identify a recruiting strategy aimed at attracting the specific talent they need to excel in their industry. A career as a Recruiter involves attracting potential candidates, screening, and evaluating candidates’ qualifications with great attention to detail. Trillium Staffing provides companies with the top level of talent available in their industry, allowing our clients the opportunity to take on additional work load with the confidence that they have the right staff in place to provide their clients with a viable product and an excellent customer experience. “As a Recruiter at Trillium, I have the pleasure of assisting not only our reputable clients find their next team member, but professionals find their next career opportunity. We take pride in finding quality over quantity which makes us stand out in the staffing industry. With a team-driven environment, we build off each others’ strengths which enables continued growth in your career path. Trillium values each and every one of their employees which is distributed by the reward provided both financially and through industry recognition. I find myself lucky to have found a home at Trillium.” stated Katie Instefjord, Recruiter with Trillium Staffing. A Recruiter role with Trillium Staffing involves recruiting, interviewing, conducting reference checks, background checking, verifying skills and qualifications, and managing field employees. Our Recruiters interact with employees and clients on a daily basis to conduct dispatching efforts, counsel staff, and conduct hiring and termination procedures. Our Recruiters’ backgrounds range from experienced staffing professionals to those who have previous held recruiting or human resources positions in other industries. If you enjoy a challenging position, are detail oriented, enjoy interacting with others, and have an interest or previous experience in the staffing industry; consider a career as a Recruiter with Trillium Staffing Solutions. Click here to express interest in a staffing career with Trillium Staffing Solutions, recognized as a national leader in staffing and recruitment. Whether you are experienced in the staffing industry or possess outside sales experience in a service based industry; if you are seeking a career change a Sales Representative position with Trillium Staffing may be the right fit for you! Our Sales Representatives work closely with employers to identify a recruiting and staffing plan that best fits the needs of their organization. Providing companies with the top level of talent available in their industry allows our clients the opportunity to take on additional work load with the confidence that they have the right staff in place to provide their clients with a viable product and an excellent customer experience. “As a Sales Representative at Trillium Staffing Solutions, I have had the pleasure of working with some of the most dedicated individuals in the industry. Our priority is always the complete satisfaction of the customer. At Trillium, I have been able to combine my experience with the best resources in the business to reach both personal and financial goals. It is very rewarding to watch our customers succeed as a direct result of our partnership.” stated Trent McPheeters, Sales Representative with Trillium Staffing. A Sales Representative role with Trillium Staffing involves cold calling, following up on client inquiries, providing rates and proposals, account management, and coordination of field staff. Our Sales Representatives’ backgrounds range from experienced staffing professionals to those who have previous held sales positions for service based based businesses. If you are driven to provide results, have previous experience or an interest in the staffing industry, and are looking for a career that provides a strong professional and personal life balance; consider a Staffing Sales Representative career with Trillium Staffing. Click here to express interest in a staffing career with Trillium Staffing, recognized as a national leader in staffing and recruitment. Whether you are experienced in the technical staffing industry or possess outside sales experience in a technical field; if you are seeking a career change a Technical Sales Manager position with Trillium Technical may be the right fit for you! Our Sales Managers work closely with employers to identify a recruiting and staffing plan that best fits the needs of their organization. Providing companies with the top level of technical talent available in their industry allows our clients the opportunity to take on additional work load with confidence that they have the staff in place to provide their clients with a viable product and an excellent customer experience. A Sales Manager role with Trillium Technical involves cold calling, following up on client inquiries, providing rates and proposals, account management, and supervision of staff. Our Sales Managers’ backgrounds range from technical staffing professionals to those who have previous held sales positions for technology based businesses. If you are driven to provide results, have previous experience or an interest in the technical industry, and are looking for a career that provides a strong professional and personal life balance; consider a Technical Sales Manager career with Trillium Technical. Click here to express interest in a technical staffing career with Trillium Technical, recognized as a national leader in technical staffing. Whether you are experienced in the environmental staffing industry, or possess outside sales experience in a skilled trade; if you are seeking a career change a Sales Manager position with Trillium Environmental Services may be the right fit for you! Our Sales Managers work closely with outside contractors and facilities to identify a environmental or heavy industrial staffing plan that best fits the needs of their projects and budgets. Providing contractors and facilities with predictable pricing allows our clients the opportunity to provide more accurate bids and have the security of knowing that they can obtain the skilled trades talent to get the job done right and on time. A Sales Manager role with Trillium Environmental involves cold calling, following up on client inquiries, providing rates and proposals, account management, and supervision of staff. Our Sales Managers’ backgrounds range from project managers to those who have previous held sales positions for skilled trades industry suppliers. If you are driven to provide results, have previous experience or an interest in the environmental or heavy industrial industries, and are looking for a career that provides a strong professional and personal life balance; consider a Sales Manager career with Trillium Environmental Services. Click here to express interest in a construction staffing career with Trillium Environmental Services, recognized as a national leader in environmental and heavy industrial staffing. Whether you are experienced in the driver staffing industry or have previous recruiting or HR experience in another industry; if you are seeking a career change a Recruiter position with Trillium Driver Solutions may be the right fit for you! Our Recruiters work closely with clients to identify a recruiting strategy aimed at attracting the specific talent they need to excel in their industry. A career as a Recruiter in driver staffing involves attracting potential candidates, screening, and evaluating a driver’s qualifications with great attention to detail. Trillium Driver Solutions takes pride in our ability to locate safe and professional drivers across the country for clients ranging from third party logistics companies to manufacturing facilities. Providing clients with predictable pricing for casual drivers, temp to hire drivers, and permanent drivers; we allow our clients the opportunity to take on additional business and routes with the security of knowing that they’ll have safe and professional drivers to represent them to their customers. “As a Senior Recruiter for Trillium Drivers- National Accounts, I have been able to incorporate my expertise in logistics, my skills in several years of recruiting, and my desire to support the needs of current and prospective clients. The National Recruiting Center for Trillium Drivers is dedicated to assist filling CDL driving positions for long term or permanent placements so our clients can focus on their business at hand. The level of pride our staff takes in their work, our employees, and our clients’ success sets us apart from the competition.” stated Damian Hendricks, Senior Recruiter for Trillium Drivers. A Recruiter role with Trillium Driver Solutions involves recruiting, interviewing, conducting reference checks, background checking, verifying qualifications and DOT eligibility, and conducting motor vehicle reports. Our recruiters interact with employees and clients on a daily basis to conduct dispatching efforts, counsel staff, and conduct hiring and termination procedures. Our Recruiters’ backgrounds range from former logistics supervisors to those who have previous held dispatching roles for the logistics industry. If you enjoy a challenging position, are detail oriented, enjoy interacting with others, and have an interest or previous experience in the logistics industry; consider a career as a Recruiter with Trillium Driver Solutions. Click here to express interest in a driver staffing career with Trillium Driver Solutions, recognized as a national leader in driver staffing. Whether you are experienced in the driver staffing industry or have outside sales experience in the logistics industry; if you are seeking a career change a Selling Branch Manager career with Trillium Driver Solutions may be the right fit for you! Our Selling Branch Managers work closely with clients to identify a driver staffing plan that best fits the needs of their business. Providing clients with predictable pricing for casual drivers, temp to hire drivers, and permanent drivers; we allow our clients the opportunity to take on additional business and routes with the security of knowing that they’ll have safe and professional drivers to represent them to their customers. “I love coming to work every day and appreciate the opportunity that I have with Trillium. Yes, it might of come late in my working career but it could not be appreciated anymore by anyone, since I have worked for several companies in my career I know I finally found the best, I enjoy every day, and take every opportunity to tell employees, clients, family and friends what a great company Trillium is and the opportunities we have. It is so important for employees to know they are appreciated and their efforts are noticed as well as the encouragement we receive.” stated Selling Branch Manager, Deb Scott. A Selling Branch Manager role with Trillium Driver Solutions involves cold calling, following up on client inquiries, providing rates and proposals, account management, and supervision of staff. Our Selling Branch Managers’ backgrounds range from former logistics supervisors to those who have previous held sales positions for the logistics industry. If you are driven to provide results, have an interest or previous logistics industry experience, and are looking for a career that provides a strong professional and personal life balance; consider a Selling Branch Manager career with Trillium Driver Solutions.